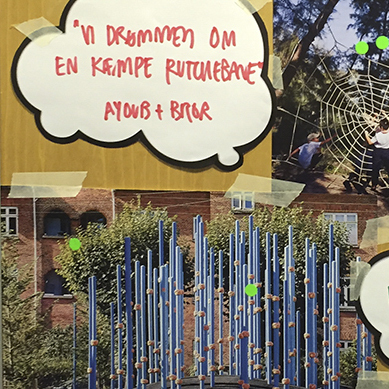 Last Wednesday we had a user involvement session at Vesterbro Ungdomsgård, Where we talked to the members about their dreams, needs and preferences for the front yard. The front yard makeover project was launched in 2014, and now arki_lab together with Vesterbro Ungdomsgård is taking the last steps to making a physical change in the front yard. This Project is founded by the Danish Arts Foundation, and as it is always the case in our projects, the educational focus is one of the most important aspects of the project. Vesterbro Ungdomsgård is a youth club located in the heart of Vesterbro, one of the hippest areas of Copenhagen. Since its establishment in 1958, Vesterbro Ungdomsgård has always been a pioneer in progressive musical and theatrical scenes, a reputation that it has maintained until this day. Vesterbro, the neighborhood in which Vesterbro Ungdomsgård is located has changed drastically over the last few decades, moving away from a working-class neighborhood with bodegas on every corner, to one of the most fashionable neighborhoods of Copenhagen. Vesterbro Ungdomsgård too, with its progressive nature, has responded to the changes in its surrounding. The new 600 sq2 annex, opened in 2005 is one of the examples of this responsiveness. The new hall is built to accommodate the new needs of the community and to provide the youth with a flexible space for singing, dancing and exercising. In line with these new changes and improvements, a couple of years back, Vesterbro Ungdomsgård started collaboration with arki_lab to identify the members’ wishes for its front yard for its future development. We have conducted several workshops and teaching sessions at Vesterbro Ungdomsgård, where we have worked with the younger members. Together with them we developed several scenarios for the front yard, and during the last summer, together with them we conducted a pilot project. The idea was simple: We made several mobile wooden boxes to test out different scenarios for the front yard and to investigate how the members use the boxes to accommodate their different needs. To our pleasure, our small pilot project proved to be successful. The boxes are used to make sitting areas, delineate a football pitch, make pop-up playgrounds and more. Now it is time for Vesterbro Ungdomsgård to move forward with the project and to use the knowledge drawn from the pilot project to make more permanent changes. To make this happen, we are running a second round of workshops where we involve the older members, the staffs and the parents. The first workshop of the second round took place last Wednesday. We went to Vesterbro Ungdomsgård with a map of the area, big markers, speech bubbles and a series of inspirational images. We sat around a table with members, asked them how they use the front yard as it is today, then we asked them to look at the inspirational images and tell us about their dreams for the future development of the front yard. We heard so many inspiring, interesting ideas. One of the recurrent ones was a huge water slide and one of the most radical ones was a rooftop pool! However, what was easy to conclude, was that the younger members are more focused on the playgrounds and playful elements, whereas the older members are more focused on spaces where they can hang out with their friends and chill out. And that is the beauty and challenge of citizen involvement. Different people from different ages and backgrounds have different, and sometimes conflicting demands. The question is, how we, as urban planners and designers, create spaces that best respond to a variety of needs. This is especially important for Vesterbro Ungdomsgård for its history, its reputation and the role that it is playing in the neighborhood. It is exciting, isn’t it? Stay tuned to see how we proceed.